Methane is a greenhouse gas that dairy cattle produce due to enteric fermentation. But, why is methane mitigation important to the dairy cattle industry and the environment? Is too much methane being released to the atmosphere? Figure 1. Close up of a heifer in a free stall barn during feeding time. Photograph by Lance Cheung, USDA, 2011, FlickrCommons. Public Domain. Methane (CH4), a greenhouse gas, is considered to be a major cause of climate change due to its ability to trap 25 times more heat in the atmosphere than carbon dioxide (CO2).3,4,11 One of the major contributors to worldwide methane production is the dairy cattle industry.1 Cattle possess a microbial population in their gut to ferment otherwise indigestible feeds.7 One of the byproducts of this process is methane, which is released in the form of flatulence.8 The average adult dairy cow can belch 400-500 liters of methane in a single day.8 One way researchers are attempting to mitigate methane production is by altering feed by means of adjusting silage ratios, forage mixtures, supplementation, and/or the addition of certain acids.1,3,4,5,9,12 Although some studies have found potential in these dietary changes, more research needs to be conducted to find the best balance between the reduction of methane, cost effectiveness, animal welfare, and dairy cattle productivity. Figure 2. United States methane emissions from agricultural sources, 2009. Total =215.9 million metric tons carbon dioxide equivalent. Data courtesy of the U.S. Energy Information Administration., 2011. Public Domain. Rising levels of greenhouse gasses like methane are causing more of the sun’s heat to be trapped within Earth’s atmosphere.2 Greenhouse gasses naturally trap the sun’s heat to keep the planet at a hospitable temperature for life. However, increasing levels of greenhouse gasses attributed to human activity are causing the Earth to trap more heat, leading to disastrous impacts such as rising sea levels, extreme weather, and an increase in natural disasters such as forest fires and drought.2 Furthermore, enteric methane constitutes 17-30% of methane from human activity, and 11-17% of methane produced globally.1 Since the dairy industry contributes such a large amount of methane on a global scale, developing methods to reduce the industry’s contribution is necessary. 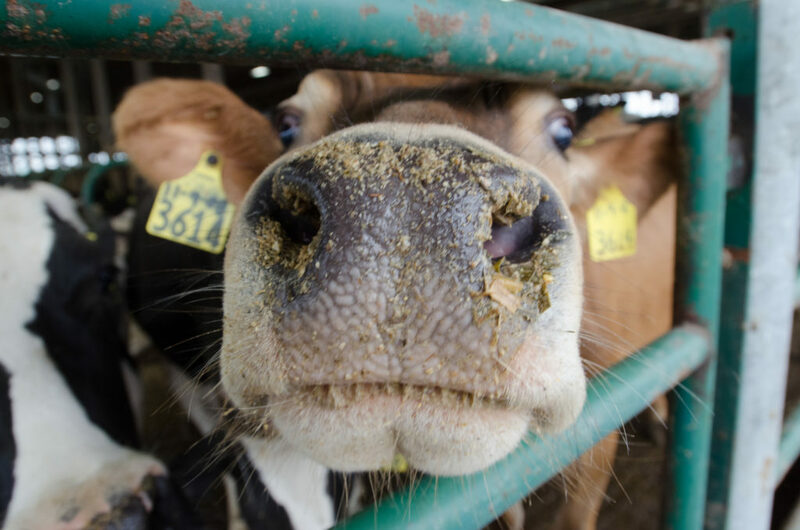 Therefore, by mitigating its methane emissions, the dairy industry can do its part to lessen human contribution to climate change while increasing the sustainability and efficiency of an industry that is deeply embedded within the culture, community, and economy of the United States. Although many different approaches are being made to decrease greenhouse gas emissions from dairy cattle (such as upgraded housing systems, genetically modifying dairy cattle, and new ventilation systems), one of the most prominent solutions has been dietary changes that mitigate methane production by either directly impacting the methanogens, or by indirectly changing the substrates available in the rumen.7 Nevertheless, the best methane mitigation strategy will depend on the geographic location of the animals, the style of dairy farm, and the feed available.7 One method attempted by researchers from the School of Agriculture, Policy, and Development at the University of Reading and the Institute of Science and the Environment at the University of Worcester is to adjust dairy cattle diets by looking at the impacts of forage mixtures on methane production in growing dairy heifers.3 Two techniques were used to measure methane emissions: staggered rotations within respiration chambers for five days, and four day methane measurements using the sulfur hexafluoride tracer technique.3 Based on their experiments, the researchers concluded that heifers fed flowers, legumes, or forages containing secondary plant compounds had lower methane emissions.3 This result was considered to be due to the lower digestibility of the feed. However, the lower feed intake and lower overall production would be a problem if the dairy industry is to implement this feeding method. Therefore, more research is necessary on this method before it can be successfully utilized. Figure 3. Density of cattle and calves in the United States by county in 2007. Original figure modified from Manore et al., 2013, Wikimedia Commons. CC BY 3.0. Another experimental mitigation method was the effect of dietary starch concentration on ruminal fermentation and methane production in dairy cattle.9 Scientists at the Research Center of the Department of Agriculture and Environmental Sciences at the University of Milan, Italy found that high starch diets decreased methane production, and low starch diets with fish oil supplementation showed potential for methane reductions, but failed to have decisive results. Fish oil supplementation also showed a negative impact on milk fat.9 Therefore, high starch diets are a possible method to mitigate methane when applied in the proper situation. Fish oil supplementation could be problematic for dairy farmers due its negative impact on milk fat.9 In a study completed in 2015 by researchers from the Animal Nutrition Group at Wageningen University in the Netherlands, it was discovered that diets higher in starch in place of fiber in lactating dairy cows also reduced methane production per unit of estimated rumen-fermentable organic matter.4 This result was due to the fact that starch favors the production of propionate, which follows an alternate path of hydrogen removal rather than methanogenesis.4 Similar to the other studies, more research is needed on the impact this dietary change has on milk production, dairy farms, and the farmers themselves. Lastly, another study published in 2011 looked at the use of dietary nitrate supplementation in cows to reduce methane production.12 The researchers observed 20 Holstein-Friesian dairy cows, sorted them by parity, lactation stage, and milk production. After a four week adaptation period, they measured the amount of methane produced, energy balance, and the diet’s digestibility using open-circuit indirect calorimetry chambers.12 The results indicate that the inclusion of nitrate decreased methane production by 16% and reduced overall energy losses. However, the diet did not improve milk production.12 Although many of the results of these experiments are promising, they cannot act as a uniform solution for every dairy operation due to differing conditions and varying needs. By conducting more research using different situations, enhanced mitigation methods can be achieved. Therefore, more research must be conducted to properly assess the benefits of methane mitigation methods to find the best possible means to reduce emissions while maintaining a productive, welfare-oriented environment for the dairy cattle. Figure 4. Cattle feeding on corn sillage. Photograph courtesy of Peter Van den Bossche, 2008, Wikimedia Commons. CC BY-SA 2.0. Beauchemin, K.A., et al. (2009). Dietary mitigation of enteric methane from cattle. CAB Reviews: Perspectives in Agriculture, Veterinary Science, Nutrition and Natural Resources, 4(35):1-18. Hammond, K.J., et al. (2014). The inclusion of forage mixtures in the diet of growing dairy heifers: Impacts on digestion, energy utilization, and methane emissions. Agriculture, Ecosystems, and the Environment, 197(1):88-95. Hatew, B., et al. (2015). Effects of dietary starch content and rate of fermentation on methane production in lactating dairy cows. Journal of Dairy Science, 98:486-499. Hook, S.E., et al. (2010). Methanogens: Methane Producers of the Rumen and Mitigation Strategies. Archaea, 2010:1-11. Keyserlingk, M.A.G., et al. (2013). Invited review: Sustainability of the US dairy industry. Journal of Dairy Science, 96(9):5405-5425. Morgavi, D.P., et al. (2010). Microbial ecosystem and methanogenesis in ruminants. Animal, 4(7):1024-1036. Owen, J. (2005, August 16). California cows fail latest emissions test. National Geographic. Retrieved from http://news.nationalgeographic.com/news/2005/08/0816_050816_cowpollution.html. Pirondini, M. (2015). Effect of dietary starch concentration and fish oil supplementation on milk yield and composition, diet digestibility, and methane emissions in lactating dairy cows. Journal of Dairy Science, 98(1):357-372. Russel, J.B., & Rychlik, J.L. (2001). 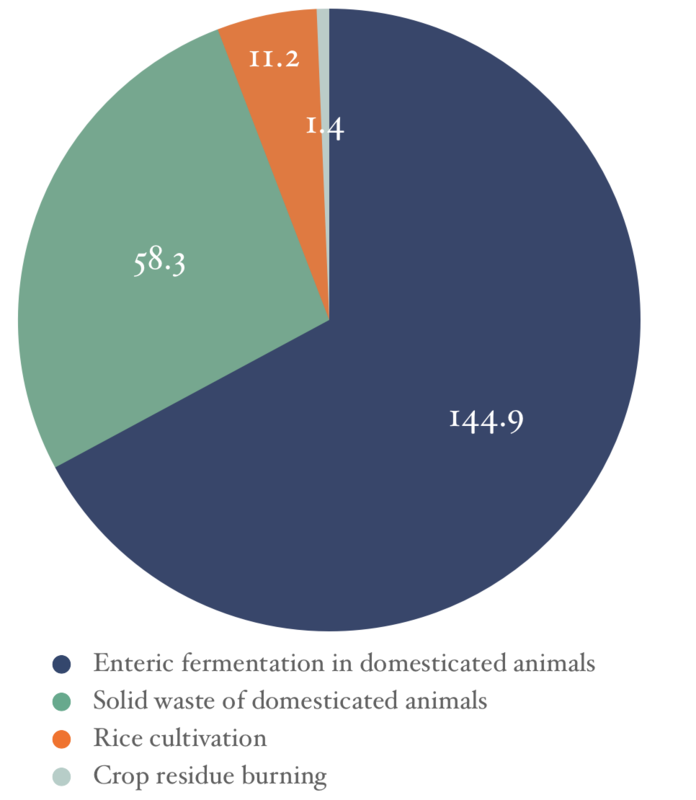 Factors That Alter Rumen Microbial Ecology. Science, 292(5519):1119-1122. Storm I.M.L.D., et al. (2012). Methods for Measuring and Estimating Methane Emission from Ruminants. Animals. 2(2):160-183. Van Zijderveld, S.M., et al. (2011). Persistency of methane mitigation by dietary nitrate supplementation in dairy cows. Journal of Dairy Science, 94(8):4028-4038. Bossche, Peter Van den. (2008). 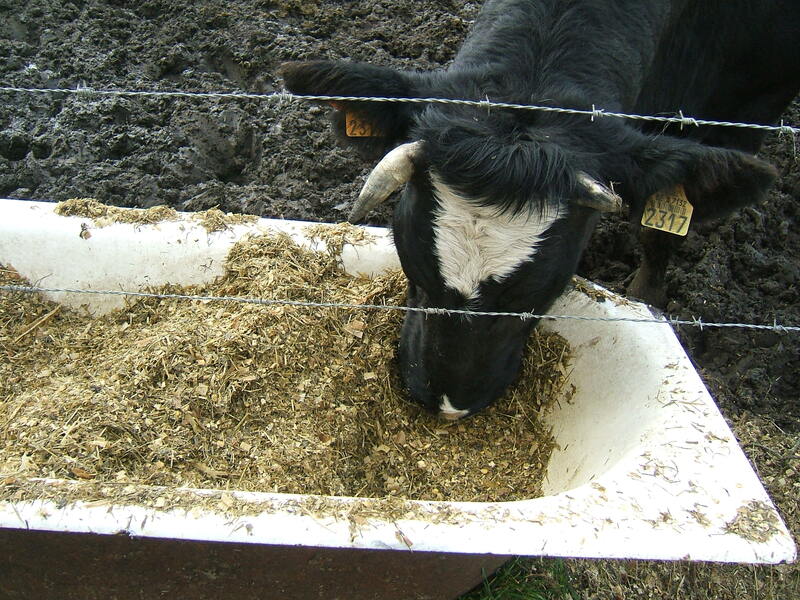 [Photograph of cattle feeding on corn silage]. Retrieved from Wikimedia Commons. CC BY-SA 2.0. Cheung, Lance, United States Department of Agriculture. (2011). [Photograph of heifer close up]. Retrieved from FlickrCommons. Public Domain. Emissions of Greenhouse Gases in the U.S. (2011). [Data for agricultural methane emissions graph]. U.S. Energy Information Administration. Retrieved from https://www.eia.gov/environment/emissions/ghg_report/ghg_methane.php. Manore, et al. (2013). 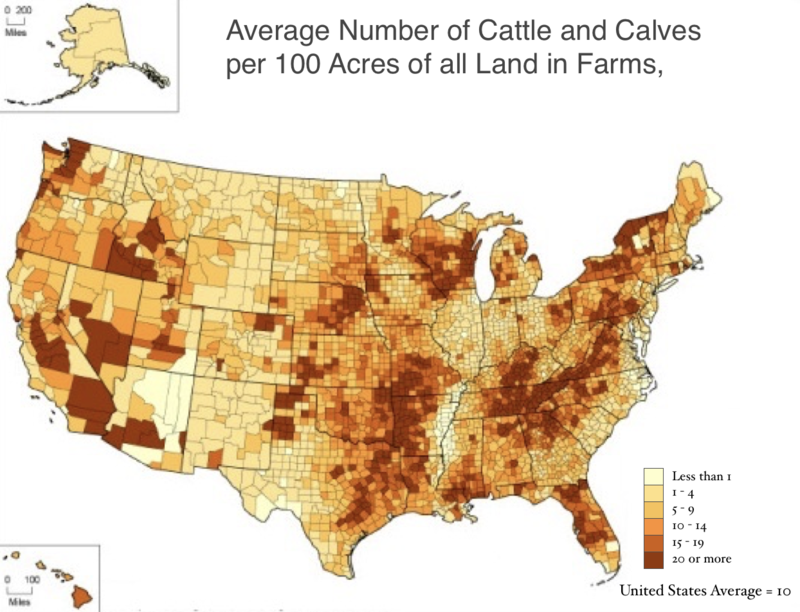 [Map of cattle and calf density in the United States]. Modified from Wikimedia Commons. CC BY 3.0.